The weather wasn't the only thing that was perfect for this festival. Food, drinks and music were all on point for the event. It was an all ages event that also allowed pets; you could even bring your own chairs and umbrellas! You received a sample cup and tickets when you arrived. Bonus! My first stop was to visit my friends at the Yelp booth. If you checked into the event with the Yelp app, you could win Yelp swag. They were also holding the People's Choice awards, so I knew I'd be back. Time for beer! 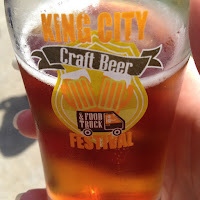 King Brewery was beckoning us. Their Vienna Lager was on tap and was the perfect brew to start the afternoon. 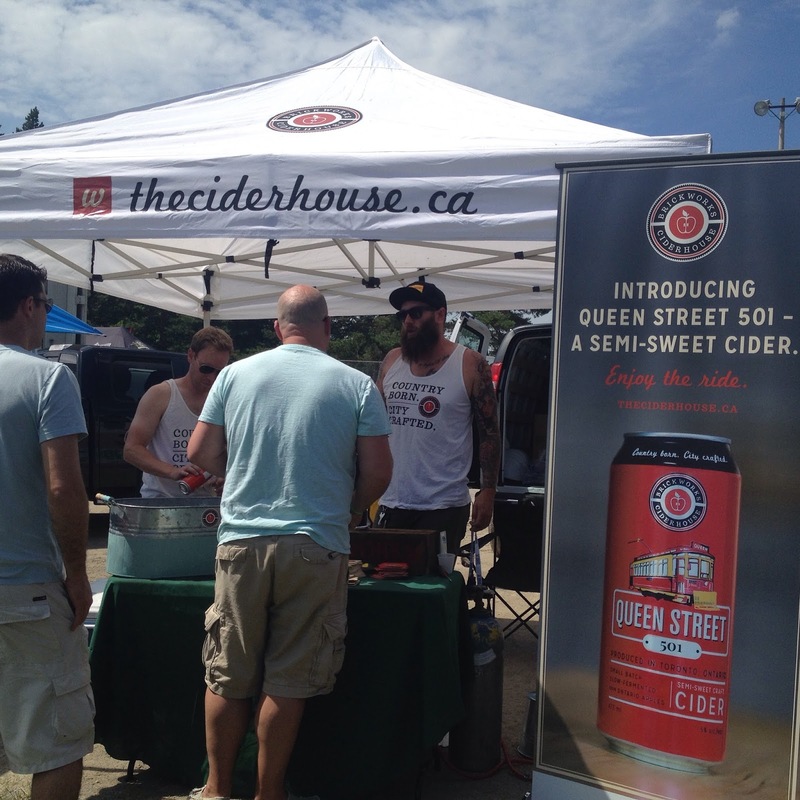 While we scoured the food truck menus, I grabbed a cider from Brickhouse. They boasted 2 types of cider; a dry cider and a semi-sweet cider. The semi-sweet cider was crisp with little to no aftertaste. Delightful! Food time! 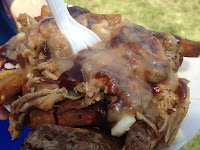 I couldn't decide, but my man had his eyes on a Pulled Pork Poutine from Kevin's Burger Obsession. The fries were pretty good. The pork was tender, but there just wasn't enough sauce to melt the cheese! Melty cheese is the best! Curbalicious was calling my name after I saw a Yelper walk by with a Fish Po Boy. I couldn't resist! The white fish was perfectly battered and the lime slaw was a nice touch. The bun was fresh and they didn't skimp on the tartar sauce. In fact, I was enjoying it so much, that my man went and got his own! 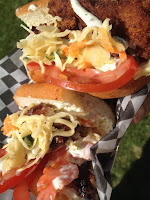 Great sandwich! There were 2 stages, the main stage and a small stage on the other side of the venue. Both showcased fantastic artists! This was a serious lineup that finished off the day with a sick band called Dear Rouge. Fan-freaking-tastic! Everyone clearly was having a great time. This was a solid event. It had a completely different vibe than Toronto events....I might have liked it better. It's just so much more relaxed! I hope it comes back next year; I'll be there!